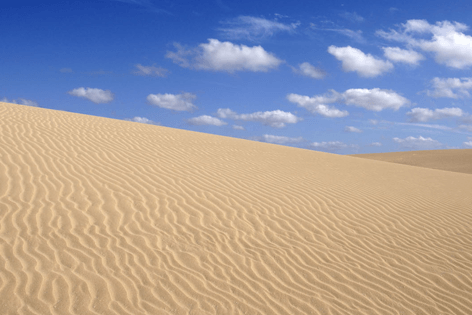 Sit and relax while you get a prompt Pick up from your hotel (all resorts) on a fully air conditioned coach with an English speaking guide, so that you are more than comfortable to start discovering the breathtaking Sand Dunes of Fuerteventura. 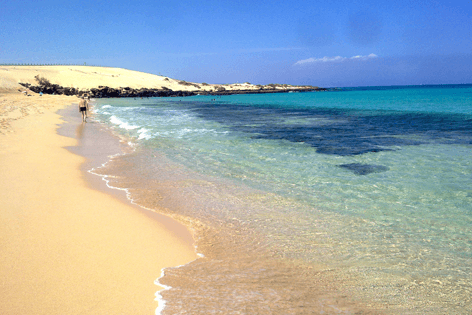 As you head to the harbour of Playa Blanca, the gateway to Fuerteventura and where all the Ferries in Lanzarote depart, enjoy the harbour’s hustle and bustle. You board a Glass bottom catamaran for a 40 minute crossing to Fuerteventura, on the way the boat will stop allowing you to go down to the lower deck where the submarine vision windows allow you to watch the crew feed the fish and see the marine life up close, you will love this as much as the kids. 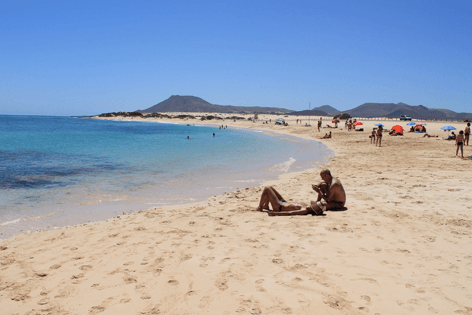 You will arrive in the harbour of Corralejo, where the air conditioned coach takes you into the town for your own 1 ½ hours of free time to experience what Corralejo has to offer. The many bars and restaurants are there to sit back and relax and enjoy a drink watching the world go by, there is also a huge shopping center ideal to get some shopping bargains. 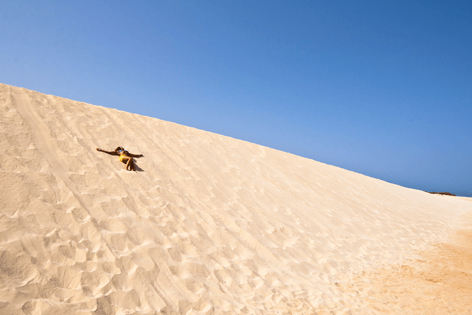 The guide and the coach will pick you back up from Corralejo and head to the Natural Park of Fuerteventura with its stunning sand dunes and caribbean style beaches. 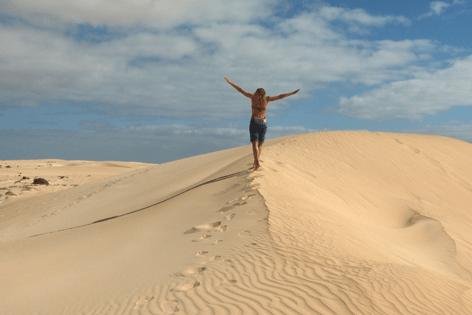 This is a truly magical place, the guide will tell you lots of interesting facts about the island and take you for a walk up to the highest point of the dunes where you will get some spectacular views. Guests who have booked the lunch option will go to the restaurant for a three course lunch which includes Mixed Salad, a choice of three dishes, chicken, Paella or pasta and all to be washed down with wine and water with your meal. You also get a small ice cream for dessert. Those who did not book the lunch option can still go to have a meal of their choice at the restaurant or choose to eat in one of the beach bars or bring a packed lunch. Here we stop for the rest of the day in the natural park and the beaches. After lunch it is free time in and around the Natural Park, spend time on the caribbean style beaches, take a further walk to investigate the Sand Dunes, even ride a camel. You do as part of this excursion get a discount on sun loungers and all amenities such as showers and toilets. You will depart the beaches and head to the harbour to take the boat back to Lanzarote at 17:15pm. 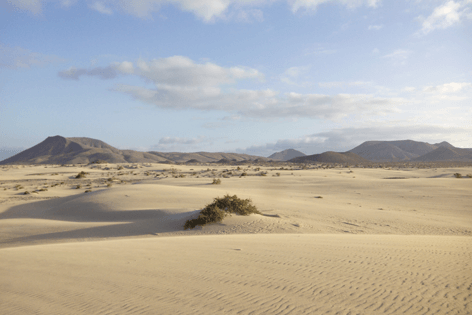 You arrive back to Lanzarote at around 18:00pm to be taken back to your hotels and apartments. Take a pullover as some times of the year it, can be windy, June - September you may not need one. Wear comfortable footwear. Take a bottle of water for the transfer on the coach, if you have booked without lunch you can usually get the hotel to prepare you something. Don´t forget your camera, you don´t want to miss the incredible sights in store for you. Take some spending money for souvenirs or extras. Even All inclusive excursions have things you can buy like souvenir photos.